Kenneth Branagh updates Agatha Christie's most famous story, starring as iconic detective Hercule Poirot in this star-studded murder-mystery. Considering the vast back catalogue of novels featuring Hercule Poirot – 33 in total – it’s surprising that it has taken this long for Agatha Christie’s moustachioed Belgian sleuth to get a shiny new Hollywood adaptation. That kind of IP is ripe for the current slate of franchise films and it seems, in Kenneth Branagh, the legendary detective has found the right director and star to bring him back to the big screen. He takes the reins for this adaptation of Christie’s most famous novel, Murder on the Orient Express, which was last adapted for the screen to great acclaim in 1974, in Sydney Lumet’s star-studded, Oscar-winning version. Branagh’s take is unlikely to bother awards bodies come the end of the year but it is an enjoyable thriller that boosts its own impressively starry cast. Sporting an accent that treads the line between fun and downright awful and a moustache that badly crosses that line, Branagh is a wonderful Poirot. He imbues the role with the intelligence and confidence you might expect of a world-famous detective, portraying the character as both a brilliant detective and a slightly foolish showman whose resolve is tested by a crime that does not easily fit into his black-and-white, right-and-wrong view of the world. 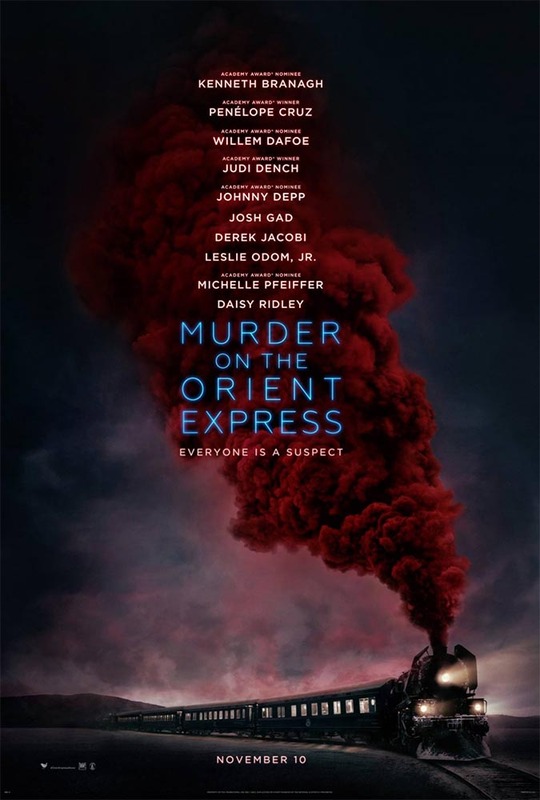 This is a well-known story so the crime and how it plays out will no doubt be familiar to many, but it centres on the murder of a gangster named Ratchett (Johnny Depp) aboard the Orient Express. With Poirot also on the train, he is recruited to investigate the grisly crime, locking down the first class cabin and interviewing everyone aboard. Every passenger appears to be hiding something of their own, from Daisey Ridley’s governess and Leslie Odom Jr’s doctor, to Judi Dench’s Russian princess and Michelle Pfeiffer’s flirty socialite, and the cast all relish the chance to act increasingly shifty. The prospect of dumping so many big names into a classic whodunnit is an endearingly old-fashioned idea and Branagh runs with it, delivering a film that’s an appealing throwback to lavish studio productions of yesteryear. There are some attempts to update the story; some of them work, like an epic, hugely cinematic sequence that sees the train become derailed by an avalanche. Others less so, like a chase scene that ultimately leads nowhere and feels like a clumsy attempt to inject more action. Truth is, the film doesn’t need it; Branagh keeps things moving along at a clip and finds enough ways to shoot the train to keep the film visually interesting. Whether his camera is gliding along the outside of the train, revealing a famous face in every window, or following Poirot’s meticulous investigation from above the cabin, Branagh shows an impressive versatility and ingenuity in a film that could’ve been visually predictable. Where the film starts to wobble is in its famously twisty third act, where the multitude of reveals are mishandled and the tension of the finale is somewhat deflated. There’s a clunky tonal shift as well, where the film abandons the knockabout laughs of its earlier scenes and becomes much more self-serious. Granted, the nature of the crime(s) involved is deadly serious but the finale feels a lot heavier than the preceding film has earned. Branagh is a good enough actor to sell Poirot’s emotional arc as he comes to terms with this particularly tangled murder but as a director, he can’t quite stick the landing. Nonetheless, Murder on the Orient Express is an appealingly slick winter blockbuster that successfully updates an iconic character for our current cinematic climate. Whether a film that relies on such old fashioned concepts as movie stars and mystery plots will appeal to a wide-enough audience to guarantee a sequel remains to be seen, but Branagh has proven himself a safe pair of hands behind the camera and a sturdy moustache in front of it.